You can fill this Tasty Tackle Box with sweet treats or throw in some homemade fishing lures and hooks. 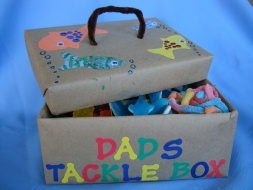 A great craft or gift for Father's Day or for any fish lover, suitable for preschoolers on up! A preschooler will need an adults help with the wrapping and cutting parts of this craft, but they will have lots of fun decorating and filling the tackle box. 1. Wrap your shoe box with brown paper. Wrap the bottom and the lid separately. 2. Decorate your tackle box. We wrote a message on ours and then decorated the top with fish cut out from construction paper and tin foil. We also decorated with markers, be creative! 3. With a pencil poke two holes in the top of your box. 4. Bundle 3 of your pipe cleaners together. Use the fourth pipe cleaner to wrap around the bundle to keep it together. Wrap it from top to bottom. 5. Thread each end of the pipe cleaner into the holes in the lid. Twist underneath to keep them in place. If you want to end here you can, just fill up the box and enjoy. If you want to make "dividers" for inside your tackle box then carry on to the next step. It's quite quick and easy to make the dividers it just takes a bit of explaining. 6. To make the dividers you will need to cut three strips of heavy paper or thin cardboard. Cut one strip to match the length of your box. Cut two smaller strips to match the width of your box. 7. In each of the smaller strips, cut a slit down the middle. Make sure you don't cut all the way through, leave a small bit at the end uncut. 8. Slide the large strip into the slits of the two smaller strips and place it inside your box. 9. Fill your box up will gummy worms and fish. You can make your own lures by cutting out shapes from cardboard and covering them with tin foil. You can make your own hooks by bending and shaping pipe cleaners.